A whole version of Almond Roca bits, well at least its sort of similar and is great on top of ice cream. This is a really good topping to prepare for an ice cream sundae buffet party along with lots of colorful yummy fruits. This topping is crazy good. If you like Almond Roca you’ll love this lighter whole version of it as a topping for ice cream. 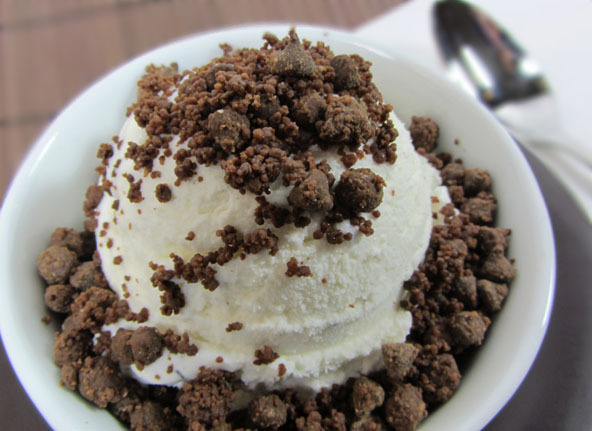 It took a few versions to create, but when I gave it to my husband to try on vanilla ice cream he immediately said, “This tastes a little like that candy you used to get at Christmas time – Almond Roca.” Yes! In a small mixing bowl, stir all ingredients together except for the chocolate chips. Then add the chocolate chips and stir until the mixture starts sticking to the chocolate chips or nibs. Can use your hands for this. Done! You can refrigerate or freeze the leftovers in a zip-lock baggie for another time. This topping is exceptionally good served on top of Voluptuous Vanilla Ice Cream.